Wishing that was me poolside right now...but that's not what this is about. The tunics featured are by Mott 50 and have a UPF 50 (Ultraviolet Protection Factor - the clothing equivalent of SPF in sunscreen). I learned about the brand from a colleague last week and a piece of Daily Candy yesterday reminded me to share. The brand offers an entire line of sun protective clothing, but the tunics and dresses stand out. After reviewing some FAQ I learned that the UPF level will hold up for about 30 washes. For comparison, a regular white t-shirt has a UFP 5. If I spent more time outside I would be all for it, given the quality and style look as good in person. Thoughts? And while on the topic of the sun... I had an unfortunate experience with this product. I love the spray, so thought I would give this a shot. I expected the results to be gradual, otherwise I would have been more thorough. I woke up the next day covered in glitter with some pretty intense streaks. I applied another coat and it wasn't so bad. I am willing to give this one more try before I toss it due to poor application. i don't spend enough time outside in the summer to need something like that... but the idea is so cool! it would be very practical for a vacation or something though. I used to use Clarins sunless tanner and then just got lazy. Lately I've been getting Mystic Tans and suffering through the smell the first day. My boyfriend tells me I smell like cheez-its haha! Try self tanning body towels -- they're amazing!! You can order them online or go to your local Sally's. The Tan Towel (brand name) is what I swear by! Those tunics are so cute! I am a huge believer in sunscreen - you can still get tan!! Kate Somerville Tanning Towelettes! You can buy them at Sephora. I've never heard of clothing with "built in sunscreen" - the cool thing about that brand is that the clothing looks really cute, as well! Just a warning about the tanning towelettes - I tried the Loreal kind and it turned out pretty streaky - and I had even exfoliated before. If you are going to get towelettes, I recommend getting a more expensive brand. My friend tried the "Look Good Naked" ones they sell at Ulta and she looked like a tanned goddess afterward (and her tan was even!). I hate the smell of Jergens, too! Although more expensive, Clarins tanning gel works really well and didn't leave streaks. It even looked good on my feet! I know that ULTA carries Tan Towels as well. I'm very freckly, so I always wear 75 on my face, but I hate the extra layer! I love Sublime Bronze. Its not a tanner though. Its a one-time application just to give you the look of a tan. If you are looking for a good sunless tanning product that tans you for several days then you should try Fake Bake. I always use Jergens Natural Glow! The tunics sound awesome! I will have to look into them! Thanks for the tips everyone!! Wow tan towels are popular. personally, i've found that neutrogena works well! although sometimes it's worth it to get a spray tan form a professional, especially for big occasions. the SPF clothing is such a great idea - and so cute as well! I'm glad you liked it!! There are a bunch of striped shirts at J. Crew, I recommend looking there if you haven't already! Clothing with built in SPF? Too cool! i just saw that you also won the lovely blogger award fmor the domestic sweatheart. this is a great post, thanks for all the helpful tips...i definitely need some help in the tanning department now that its almost beach time! So cool, had never heard of this before; I was just looking at the dresses and thought they were cute and then read that they serve a purpose! Thanks for sharing... new to your blog and love it! Ugh, the smell of the Jergens self tanner is just horrid right? I've used Clarins self tanner before and although the smell isn't great, it's more bearable than Jergens and it comes out with a natural color. I just picked up some SunLabs self tanner at TJ Maxx for $20 (it's usually like $30 or $40!) and it works SO great. I'm SO tan and it's not orange AT ALL. 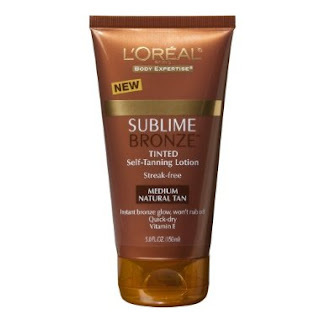 I've tried many fake tan lotions and none have been great until this one. I now swear by it. I'm actually going to put up a post about it soon. As for how to tan your feet.. that is the only thing I'm having problems with! I find that if you mix the lotion with a little bit of regular (non tan) lotion it seems to even out a tad bit. But then your feet aren't as tan.. I'm still figuring out a good way! Also with my hands.. those are tricky too.